I’m a creature of habit. When it comes to kayaking, I go back to the same couple of areas over and over again. This year I made a resolution to spread my wings and explore some new areas. On July 4th weekend, Liberty Island seemed like a good place to start. I checked the tides. High tide at 7:56 AM, combined with light traffic in the morning, would be my best bet for calmer waters. I aimed for an early start and set two alarms. I got on the road around 6:40 am, not too bad really. I headed south on the Palisades Parkway. 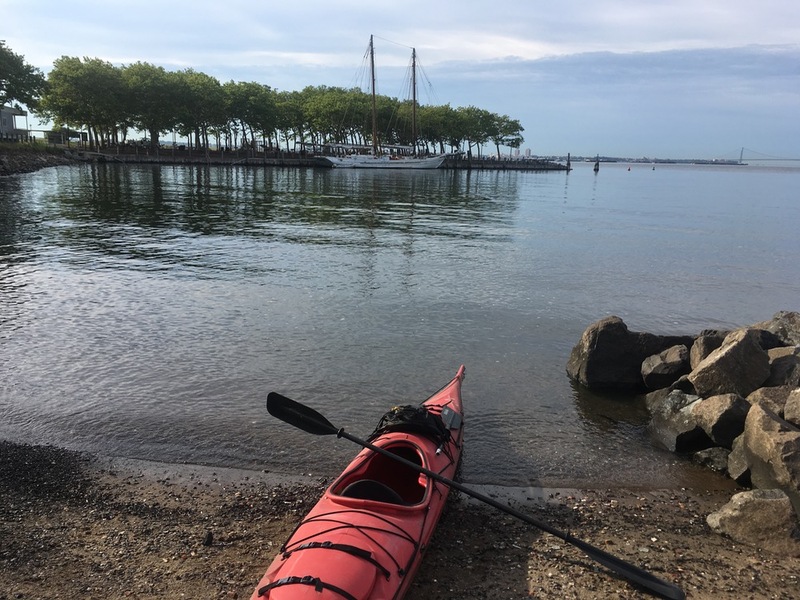 I put in on the New Jersey side at Liberty State Park, paddling solo. I was on the water by 7:40. There were a lot of early risers at the park, more joggers and cyclists then paddlers, but a couple guys launched ahead of me and another dude was pumping up an inflatable SUP as I pushed off. Liberty Island is only about a quarter mile from the launch at Liberty State Park, so it didn’t take long to get there. I aimed for the gap between Lady Liberty and Ellis Island, just to the north. Both islands have white buoys marking off restricted areas around them so I was careful to steer clear. I took my time getting out into the bay, taking in the view of lower Manhattan, and turned south to get a look at the front of the statue. In spite of the early hour, there was enough ferry and boat traffic to kick up a decent amount of chop. I kept my eye out for the bigger rollers but nothing dangerous materialized. It was a cool way to see the Statue of Liberty. As I sat, soaking in the scene, a couple of pleasure boats pulled up. On one, a group of kids assembled on the bow for a photo with the statue behind them. I’m from New York, but this was my first time seeing Liberty Island up close. I decided to make sure my kids got here before they turned 45. 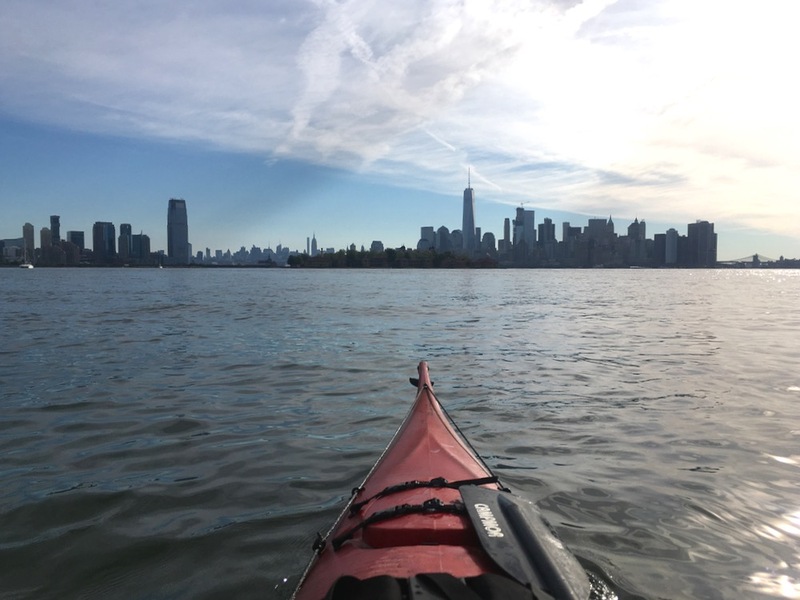 I had circled back around and was heading back north towards Ellis Island when I spotted two fellow paddlers out near where I’d started. 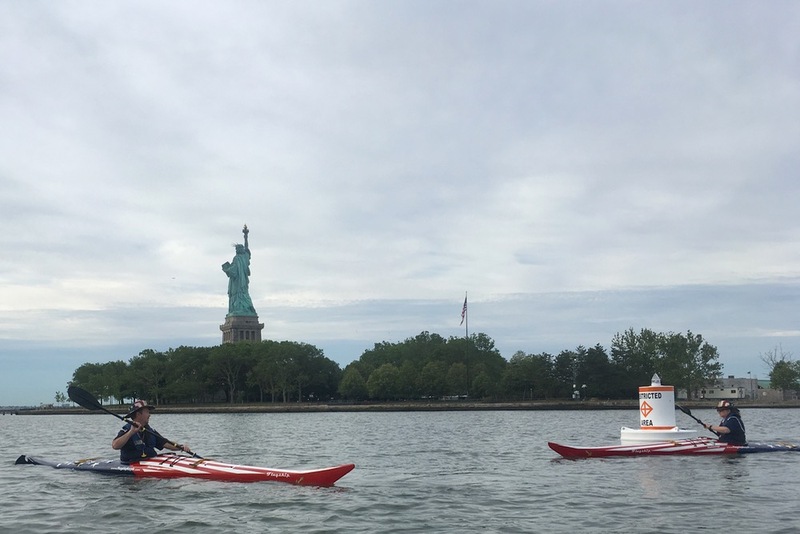 They were a couple, from Alabama, in two identical red white and blue kayaks. What could be more perfect? I chatted them up a bit; turned out they have their own website dedicated to scoping out launch sites and routes to paddle around historic sites: flagshipkayak.com. 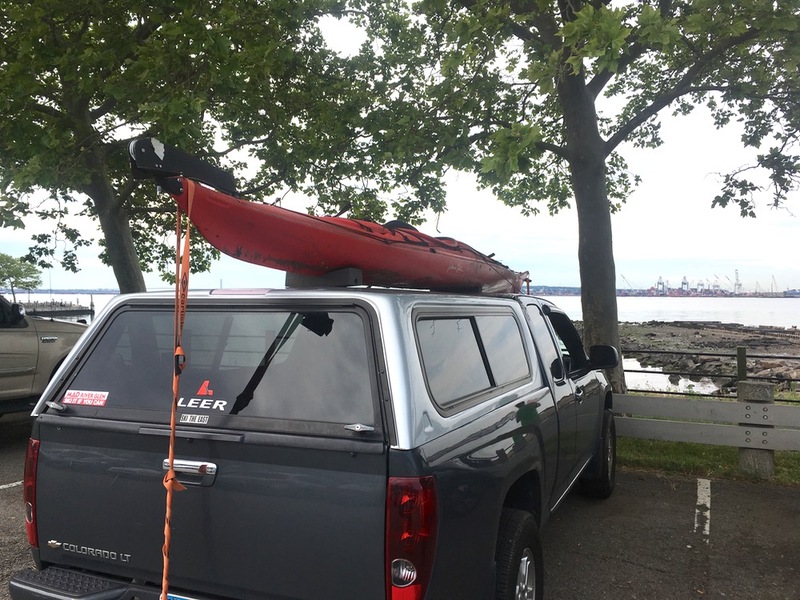 After that short detour, I resumed my course towards Ellis Island, being careful not to paddle into the restricted areas. I poked around up there a little bit. Compared to the statue, it was a lot less impressive, just a cluster of old buildings crowded onto a tiny island. There was not much to indicate the place’s huge role in our history. It was hard to believe 12 million people had been processed through here, on their way to new lives in America. I headed back to my truck, full of patriotic fervor. God bless America. Any tide issues? I learned how to sail in NY harbor (long story), and the tide going the wrong way could be a problem. I was taught a long time ago to aim for either low or high tide when I was going some place I wasn’t familiar with or that had a reputation for strong tides. It’s easier to plan nowadays since everything’s online. In this case I went right at high tide so no problems at all. Nice job, Brownski. 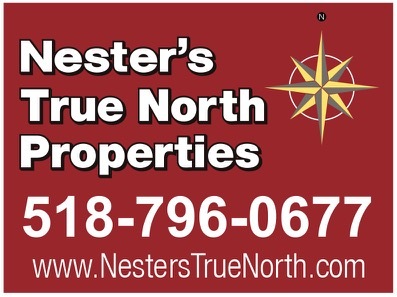 Keeping the great outdoors alive and well in the New York City suburbs. 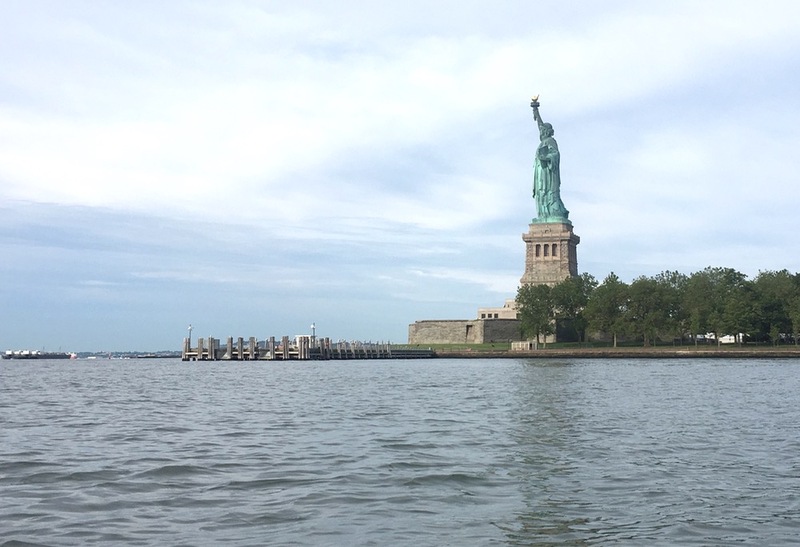 My buddy sailed down the Hudson to the Statue of Liberty this weekend as well.